Results from the phase II SORAML trial indicated that adding sorafenib to standard chemotherapy for younger patients with acute myeloid leukemia (AML) was effective, but also resulted in increased toxicity. The drug increased event-free survival and reduced need for salvage therapy and allogeneic stem cell transplantation, but also produced worse grade 3 or higher fever, diarrhea, bleeding, cardiac events, and rash compared with placebo. “After a decade of assessing the potential of kinase inhibitors in acute myeloid leukemia, their use in combination with standard treatment is becoming an important option for newly diagnosed younger patients,” wrote Christoph Röllig, MD, of Medizinische Klinik und Poliklinik I, Universitätsklinikum der Technischen Universität in Dresden, Germany, and colleagues in Lancet Oncology. Patients age 18 to 60 years were enrolled in the phase II study between 2009 and 2011. All patients had to have newly diagnosed, treatment-naive AML and a performance status of 0–2. Patients were randomly assigned to 2 cycles of induction daunorubicin plus cytarabine followed by 3 cycles of high-dose cytarabine consolidation therapy plus either sorafenib 400 mg twice daily (n = 134) or placebo (n = 133). With a median follow-up of 3 years, the researchers found that adding sorafenib to standard chemotherapy significantly improved event-free survival, from a median of 9 months with placebo to a median of 21 months with sorafenib. Patients assigned sorafenib had a 3-year event-free survival rate of 40% compared with 22% for patients assigned placebo (P = .013). 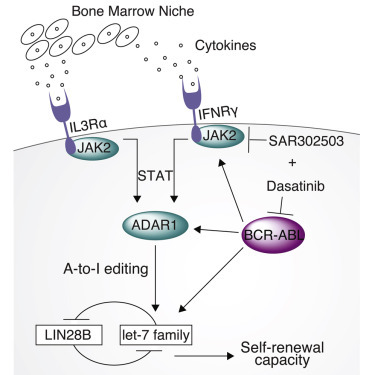 “The improvement in event-free survival and relapse-free survival is significant and clinically relevant since salvage treatment with or without allogeneic stem cell transplantation could be prevented or substantially delayed by sorafenib treatment,” the researchers wrote. At 3 years, 63% of patients assigned sorafenib and 56% of patients assigned placebo were still alive, and the median overall survival was not reached in either group. Patients assigned sorafenib had fewer relapses after complete remission compared with placebo (54 vs 34) and, therefore, fewer allogeneic stem cell transplantations were required among patients assigned sorafenib (31 vs 18). Finally, withdrawal from the trial due to adverse events was more common among patients assigned sorafenib (24% vs 12%). In an editorial published with the study, Naval Daver, MD, and Marina Konopleva, MD, PhD, of the University of Texas MD Anderson Cancer Center in Houston, pointed out that these results contrast findings by Serve et al who found that “the addition of sorafenib to standard chemotherapy in patients older than 60 years with acute myeloid leukemia resulted in increased toxicity and early mortality,” without improved antileukemic efficacy compared with placebo, suggesting that older patients were unable to tolerate the toxicities associated with the addition of sorafenib to standard chemotherapy. Induction chemotherapy can produce complete remission in most (50–70%) patients with acute myeloid leukaemia.1 However, between 50% and 80% of patients relapse, and only 20–30% achieve long-term disease-free survival. The use of reduced-intensity conditioning hematopoietic stem cell transplantation (HSCT) as a method to maintain remission was effective in a select group of older patients with acute myeloid leukemia (AML), resulting in a nonrelapse mortality (NRM) similar to that seen in younger patients, according to the results of the phase II Cancer and Leukemia Group B 100103/Blood and Marrow Transplant Clinical Trial Network 0502 trial. “Of critical importance, for the first time (to the best of our knowledge), favorable results in transplantation of older patients have been obtained in a multicenter cooperative group setting, which makes the results more likely to be generalizable,” wrote Steven M. Devine, MD, of the Ohio State University in Columbus, Ohio, and colleagues in the Journal of Clinical Oncology. According to the study, although patients aged older than 60 have complete remission rates of 50% to 60%, many will ultimately relapse. HSCT is associated with lower rates of relapse compared with chemotherapy in younger patients, but has been considered too toxic for older patients. This study looked at the use of reduced-intensity conditioning HSCT in an older patient population aged 60 to 74 years. It included 114 patients with AML who were in first complete remission. The median age of patients was 65 years. A little more than half of the patients received transplants from unrelated donors and were given rabbit antithymocyte globulin (ATG) for graft-versus-host disease (GVHD) prophylaxis. At follow-up, 71 patients had died. The median follow-up of the 43 surviving patients was 1,602 days. At 2 years, the rate of disease-free survival (DFS) was 42% and overall survival (OS) was 48%. Among patients who had unrelated donors, the 2-year DFS was 40% and the OS was 50%. “The 2-year DFS and OS rates in this group compare favorably to those in studies of conventional chemotherapy–based approaches to remission consolidation in which DFS and OS rates beyond 2 years are typically below 20%,” the researchers wrote. The NRM at 2 years was 15% and was not different among those patients with related vs unrelated donors. Forty-four percent of patients relapsed at 2 years. There was a cumulative incidence of grades 2 to 4 GVHD of 9.6% and of grade 3 to 4 GVHD of 2.6% at 100 days. The incidence of GVHD did not vary by donor type. Chronic GVHD occurred in 28% of patients. Devine and colleagues noted that these rates were lower than they anticipated. “The incorporation of rabbit ATG into the conditioning regimen for all patients, including recipients with matched sibling donors, may have contributed to the relatively low rates of GVHD and NRM, as has been observed in previous studies,” they wrote. According to Patricia Keegen, M.D., supervisory medical officer in the FDA’s Division of Oncology Products II, the agency requires a companion diagnostic test if a new drug works on a specific genetic or biological target that is present in some, but not all, patients with a certain cancer or disease. The test identifies individuals who would benefit from the treatment, and may identify patients who would not benefit but could also be harmed by use of a certain drug for treatment of their disease. The agency classifies companion diagnosis as Class III devices, a class of devices requiring the most stringent approval for medical devices by the FDA, a Premarket Approval Application (PMA). On August 6, 2014, the FDA finalized its long-awaited “Guidance for Industry and FDA Staff: In Vitro Companion Diagnostic Devices,” originally issued in July 2011. The final guidance stipulates that FDA generally will not approve any therapeutic product that requires an IVD companion diagnostic device for its safe and effective use before the IVD companion diagnostic device is approved or cleared for that indication. Close collaboration between drug developers and diagnostics companies has been a key driver in recent simultaneous pharmaceutical-CDx FDA approvals, and partnerships between in vitro diagnostics (IVD) companies have proliferated as a result. Major test developers include Roche Diagnostics, Abbott Laboratories, Agilent Technologies, QIAGEN), Thermo Fisher Scientific, and Myriad Genetics. But an NGS-based test has yet to make it to market as a CDx for cancer. All approved tests include PCR–based tests, immunohistochemistry, and in situ hybridization technology. And despite the very recent decision by the FDA to grant marketing authorization for Illumina’s MiSeqDx instrument platform for screening and diagnosis of cystic fibrosis, “There still seems to be a number of challenges that must be overcome before we see NGS for targeted cancer drugs,” commented Jan Trøst Jørgensen, a consultant to DAKO, commenting on presentations at the European Symposium of Biopathology in June 2013. Illumina received premarket clearance from the FDA for its MiSeqDx system, two cystic fibrosis assays, and a library prep kit that enables laboratories to develop their own diagnostic test. The designation marked the first time a next-generation sequencing system received FDA premarket clearance. The FDA reviewed the Illumina MiSeqDx instrument platform through its de novo classification process, a regulatory pathway for some novel low-to-moderate risk medical devices that are not substantially equivalent to an already legally marketed device. The future of CDxs therefore may be heading in the same direction as cancer therapy, aimed at staying ahead of the tumor drug resistance curve, and acknowledging the reality of the shifting genomic landscape of individual tumors. In some cases, NGS will be applied to diseases for which a non-sequencing CDx has already been approved. On January 16, 2014 Illumina and Amgen announced that they would collaborate on the development of a next-generation sequencing-based companion diagnostic for colorectal cancer antibody Vectibix (panitumumab). Illumina will develop the companion test on its MiSeqDx instrument. In 2012, the agency approved Qiagen’s Therascreen KRAS RGQ PCR Kit to identify best responders to Erbitux (cetuximab), another antibody drug in the same class as Vectibix. The label for Vectibix, an EGFR-inhibiting monoclonal antibody, restricts the use of the drug for those metastatic colorectal cancer patients who harbor KRAS mutations or whose KRAS status is unknown. The U.S. FDA, Illumina said, hasn’t yet approved a companion diagnostic that gauges KRAS mutation status specifically in those considering treatment with Vectibix. Illumina plans to gain regulatory approval in the U.S. and in Europe for an NGS-based companion test that can identify patients’ RAS mutation status. Illumina and Amgen will validate the test platform and Illumina will commercialize the test. Foundation Medicine says its approach to cancer genomic characterization will help physicians reveal the alterations driving the growth of a patient’s cancer and identify targeted treatment options that may not have been otherwise considered. FoundationOne, the first clinical product from Foundation Medicine, interrogates the entire coding sequence of 315 cancer-related genes plus select introns from 28 genes often rearranged or altered in solid tumor cancers. Based on current scientific and clinical literature, these genes are known to be somatically altered in solid cancers. These genes, the company says, are sequenced at great depth to identify the relevant, actionable somatic alterations, including single base pair change, insertions, deletions, copy number alterations, and selected fusions. The resultant fully informative genomic profile complements traditional cancer treatment decision tools and often expands treatment options by matching each patient with targeted therapies and clinical trials relevant to the molecular changes in their tumors. As Foundation Medicine’ s NGS analyses are increasingly applied, recent clinical reports describe instances in which comprehensive genomic profiling with the FoundationOne NGS-based assay result in diagnostic reclassification that can lead to targeted drug therapy with a resulting dramatic clinical response. In several reported instances, NGS found, among the spectrum of aberrations that occur in tumors, changes unlikely to have been discovered by other means, and clearly outside the range of a conventional CDx that matches one drug to a specific genetic change. In July 2015, the University of Colorado Cancer Center and Loxo Oncology published a research brief in the online edition of Cancer Discovery describing the first patient with a tropomyosin receptor kinase (TRK) fusion cancer enrolled in a LOXO-101 Phase I trial. LOXO-101 is an orally administered inhibitor of the TRK kinase and is highly selective only for the TRK family of receptors. While the authors say TRK fusions occur rarely, they occur in a diverse spectrum of tumor histologies. The research brief described a patient with advanced soft tissue sarcoma widely metastatic to the lungs. The patient’s physician submitted a tumor specimen to Foundation Medicine for comprehensive genomic profiling with FoundationOne Heme, where her cancer was demonstrated to harbor a TRK gene fusion. Following multiple unsuccessful courses of treatment, the patient was enrolled in the Phase I trial of LOXO-101 in March 2015. After four months of treatment, CT scans demonstrated almost complete tumor disappearance of the largest tumors. Whether this means CDx testing will begin to incorporate NGS sequencing remains to be seen. Alan T. Tinmouth, MD; Kelley E. Capocelli, MD; Mark D. Cipolle, MD, PhD; Claudia S. Cohn, MD, PhD; et al. Approximately 2.2 million platelet doses are transfused annually in the United States (1). A high proportion of these platelet units are transfused prophylactically to reduce the risk for spontaneous bleeding in patients who are thrombocytopenic after chemotherapy or hematopoietic progenitor cell transplantation (HPCT) (1–3). Unlike other blood components, platelets must be stored at room temperature, limiting the shelf life of platelet units to only 5 days because of the risk for bacterial growth during storage. Therefore, maintaining hospital platelet inventories is logistically difficult and highly resource-intensive (4–5). 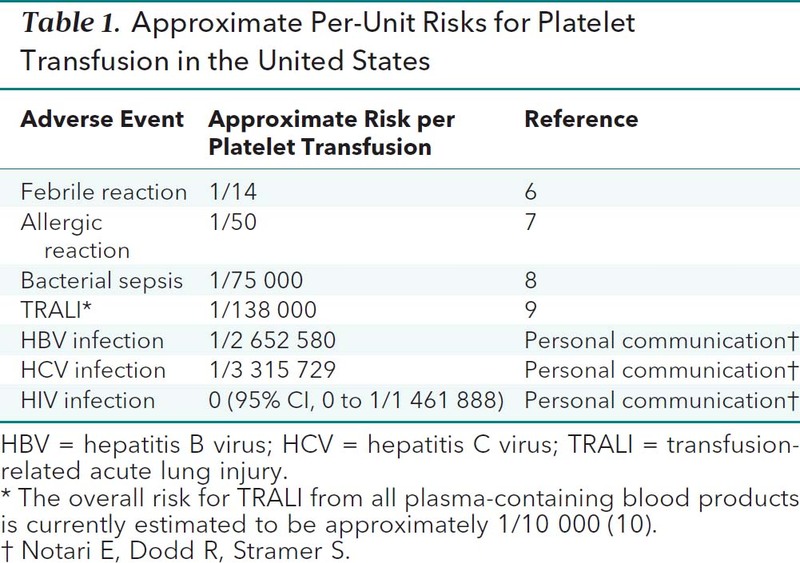 Platelet transfusion is associated with several risks to the recipient (Table 1), including allergic reactions and febrile nonhemolytic reactions. Sepsis from a bacterially contaminated platelet unit represents the most frequent infectious complication from any blood product today (8). In any situation where platelet transfusion is being considered, these risks must be balanced against the potential clinical benefits. Literature review current through: Sep 2015. | This topic last updated: Jun 12, 2015. PLATELET COLLECTION — There are two ways that platelets can be collected: by isolation from a unit of donated blood, or by apheresis from a donor in the blood bank. ●Pooled platelets – A single unit of platelets can be isolated from every unit of donated blood, by centrifuging the blood within the closed collection system to separate the platelets from the red blood cells (RBC). The number of platelets per unit varies according to the platelet count of the donor; a yield of 7 x 1010platelets is typical . Since this number is inadequate to raise the platelet count in an adult recipient, four to six units are pooled to allow transfusion of 3 to 4 x 1011 platelets per transfusion . These are called whole blood-derived or random donor pooled platelets. ●Apheresis (single donor) platelets – Platelets can also be collected from volunteer donors in the blood bank, in a one- to two-hour pheresis procedure. Platelets and some white blood cells are removed, and red blood cells and plasma are returned to the donor. A typical apheresis platelet unit provides the equivalent of six or more units of platelets from whole blood (ie, 3 to 6 x 1011platelets) . In larger donors with high platelet counts, up to three units can be collected in one session. These are called apheresis or single donor platelets. PLATELET STORAGE AND PATHOGEN REDUCTION — Platelets are stored at room temperature, because cold induces clustering of von Willebrand factor receptors on the platelet surface and morphological changes of the platelets, leading to enhanced clearance by hepatic macrophages and reduced platelet survival in the recipient [3-6]. All cells are more metabolically active at room temperature, so platelets are stored in bags that allow oxygen and carbon dioxide gas exchange. Citrate is included to prevent clotting and maintain proper pH, and dextrose is added as an energy source . The shelf life of platelets stored at room temperature is five days because of the bacterial infection risk that increases in relationship to the storage duration. This short shelf life contributes to the greater sensitivity of platelet inventory to shortages. INDICATIONS FOR PLATELET TRANSFUSION — Platelets can be transfused therapeutically (ie, to treat active bleeding or in preparation for an invasive procedure that would cause bleeding), or prophylactically (ie, to prevent spontaneous bleeding). Actively bleeding patient — Actively bleeding patients with thrombocytopenia should be transfused with platelets immediately to keep platelet counts above50,000/microL in most bleeding situations, and above 100,000/microL if there is disseminated intravascular coagulation or central nervous system bleeding. (See“Clinical features, diagnosis, and treatment of disseminated intravascular coagulation in adults”, section on ‘Treatment’ and “Spontaneous intracerebral hemorrhage: Treatment and prognosis”, section on ‘Initial treatment’.). Predicting spontaneous bleeding — There are no ideal tests for predicting who will bleed spontaneously . Studies of patients with thrombocytopenia suggest that patients can bleed even with platelet counts greater than 50,000/microL . However, bleeding is much more likely at platelet counts less than 5000/microL. Among individuals with platelet counts between 5000/microL and 50,000/microL,clinical findings can be helpful in decision-making regarding platelet transfusion. ●The platelet count at which a patient bled previously can be a good predictor of future bleeding. ●Petechial bleeding and ecchymoses are generally not thought to be predictive of serious bleeding, whereas mucosal bleeding and epistaxis (so-called “wet” bleeding) are thought to be predictive. ●Coexisting inflammation, infection, and fever also increase bleeding risk. ●Compared with adults, children with bone marrow suppression may be more likely to experience bleeding at the same degree of thrombocytopenia. In a secondary subgroup analysis of the PLADO trial, in which patients were randomly assigned to different platelet doses, children had more days of bleeding, more severe bleeding, and required more platelet transfusions than adults with similar platelet counts . However, these findings do not suggest a different threshold for platelet transfusion in children, as the increased risk of bleeding was distributed across a wide range of platelet counts. Therapeutic versus prophylactic transfusion — By convention, most authors use the term “therapeutic transfusion” to refer both to transfusion of platelets to treat active bleeding and transfusion of platelets in preparation for an invasive procedure that could cause bleeding. The term “prophylactic transfusion” is used to refer to platelet transfusion given to prevent spontaneous bleeding. Given the need to balance the risk of spontaneous bleeding with the potential complications of unnecessary platelet transfusion, the decision of whether to transfuse platelets based upon a clinical event (ie, for active bleeding or invasive procedures) or at a particular threshold (ie, to prevent spontaneous bleeding) is challenging. Standard practice has evolved to transfusion of platelets at a threshold platelet count of 10,000 to 20,000/microL for most patients with severe hypoproliferative thrombocytopenia due to hematologic malignancies, cytotoxic chemotherapy, and hematopoietic cell transplant (HCT) . However, the risks and benefits of reserving platelet transfusion for active bleeding episodes in these patients continue to be evaluated [7,16-19]. ●In a randomized trial, 400 patients with acute myeloid leukemia (AML; patients with APL were excluded) and patients undergoing autologous HCT for hematologic malignancies were assigned to receive platelet transfusions when morning platelet counts were ≤10,000/microL or only for active bleeding . Patients transfused only for active bleeding received fewer platelet transfusions during the 14-day period after induction or consolidation chemotherapy (1.63 versus 2.44 per patient, a 33.5 percent reduction). However, among patients with AML who were transfused only for active bleeding, there were more episodes of major bleeding (six cerebral, four retinal, and one vaginal) and there were two fatal intracranial hemorrhages compared with four retinal hemorrhages among patients transfused for a platelet count ≤10,000/microL. Patients undergoing HCT also experienced more bleeding episodes when transfused only for active bleeding, but most of these were minor. ●In another randomized trial, 600 patients with hematologic malignancies receiving chemotherapy, autologous, or allogeneic HCT were assigned to receive platelet transfusion for a platelet count ≤10,000/microL or only for active bleeding (the Trial of Prophylactic Platelets [TOPPS]) [21-23]. Compared with those who received prophylactic transfusions, patients transfused only for active bleeding received fewer platelet transfusions during the 30-day period after randomization, but had a higher incidence of major bleeding (50 versus 43 percent) and a shorter time to first bleed (1.2 versus 1.7 days) . There were no differences in the duration of hospitalization, and no deaths due to bleeding. In a predefined subgroup analysis, patients undergoing autologous HCT had similar rates of major bleeding whether they were transfused for a platelet count≤10,000/microL or only for active bleeding (45 and 47 percent). The findings from these trials support continued use of prophylactic transfusion for patients with hematologic malignancies and HCT until further data become available. Although the findings suggest that reserving platelet transfusion for active bleeding may be safe for some adults undergoing autologous HCT, such a strategy requires intensive monitoring and the ability to perform immediate imaging for suspected CNS or ocular bleeding. We do not recommend reserving platelet transfusion for active bleeding in patients with HCT outside of highly specialized centers with the ability to support this level of vigilance. SPECIFIC CLINICAL SCENARIOS — There are several common clinical scenarios that raise the questions of whether to transfuse patients prophylactically to prevent bleeding, and, if prophylactic transfusion is used, of what platelet count is the best threshold for transfusion. Leukemia and chemotherapy — Patients with leukemia, hematopoietic cell transplant (HCT), or those being treated with cytotoxic chemotherapy have a suppressed bone marrow that cannot produce adequate platelets. We use prophylactic transfusion in these settings. The thresholds suggested below apply to patients with thrombocytopenia who are afebrile and without active infection. If fever or sepsis is present, higher thresholds may be needed. ●Chemotherapy for solid tumors – Cancer chemotherapy often makes patients thrombocytopenic from bone marrow suppression. Randomized trials of platelet transfusion threshold in this population have not been performed. Observational studies support a prophylactic platelet transfusion threshold of 10,000/microL. A threshold of 20,000/microL may be appropriate for patients with necrotic tumors. These recommendations are generally consistent with the ASCO 2001 Guidelines (table 1) . Prophylactic platelet transfusion for a platelet count ≤10,000/microL in hospitalized patients with thrombocytopenia from therapy-induced bone marrow suppression is consistent with a practice guideline from the AABB . TTP or HIT — Thrombotic thrombocytopenic purpura (TTP) and heparin-induced thrombocytopenia (HIT) are disorders in which platelet consumption causes thrombocytopenia and an increased risk of bleeding; but the underlying platelet activation in these conditions also increases the risk of thrombosis. Platelet transfusions can be helpful or even life-saving in patients with these conditions who are bleeding and/or have anticipated bleeding due to a required invasive procedure (eg, placement of a central venous catheter), and platelet transfusion should not be withheld from a bleeding patient due to concerns that platelet transfusion will exacerbate thrombotic risk. However, platelet transfusions may cause a slightly increased risk of thrombosis in patients with these conditions; thus, we do not use prophylactic platelet transfusions routinely in patients with TTP or HIT in the absence of bleeding or a required invasive procedure. Support for this approach comes from a large retrospective review of hospitalized patients with TTP and HIT, in which platelet transfusion was associated with a very slight increased risk of arterial thrombosis but not venous thromboembolism . In contrast, the review found that patients with immune thrombocytopenia (ITP) had no increased risk of arterial or venous thrombosis with platelet transfusion. Of note, this was a retrospective study in which sicker patients were more likely to have received platelets, and the temporal relationships between platelet transfusions and thromboses were not assessed. ●TTP – Of 10,624 patients with TTP in the large review mentioned above, approximately 10 percent received a platelet transfusion . Arterial thrombosis occurred in 1.8 percent of patients who received platelets, versus 0.4 percent of patients who did not (absolute increase, 1.4 percent; adjusted odds ratio [OR], 5.8; 95% CI, 1.3-26.6). The rate of venous thrombosis was not different in those who received platelets and those who did not (adjusted OR 1.1; 95% CI 0.5-2.2). In contrast, a systematic review of patients with TTP who received platelet transfusions, which included retrospective data for 358 patients and prospective data for 54 patients, did not find clear evidence that platelet transfusions were associated with adverse outcomes . ●HIT – Of 6332 patients with HIT in the large review mentioned above, approximately 7 percent received a platelet transfusion . Arterial thrombosis occurred in 6.9 percent of patients who received platelets, versus 3.1 percent of patients who did not (absolute increase, 3.8 percent; adjusted OR, 3.4; 95% CI, 1.2-9.5). The rate of venous thrombosis was not different in those who received platelets and those who did not (adjusted OR 0.8; 95% CI 0.4-1.7). In a series of four patients with HIT who received platelet transfusions, two of three with active bleeding had cessation of bleeding following platelet transfusion, and no thromboses occurred; a literature review was not able to identify any complications clearly attributable to platelet transfusion . Platelet function defects — Platelet function defects can be inherited or acquired, and may be associated with thrombocytopenia or a normal platelet count. Platelet transfusion in these settings is typically reserved for bleeding. Typically, the approach to treating mild bleeding in a patient taking an antiplatelet agent is to discontinue the drug, assuming a favorable risk-benefit ratio. Although data are limited, platelet transfusion appears to be the best option in patients taking antiplatelet agents who experience severe bleeding . Patients taking these agents may also require urgent surgical procedures (eg, coronary artery bypass grafting, neurosurgical interventions, and others). The role of platelet transfusion in this setting is not well defined. Some clinicians give prophylactic platelet transfusions to patients taking antiplatelet drugs who require major surgery, while other clinicians use platelet transfusion only to treat excessive surgical bleeding [30,31]. These cases can be complex, and we favor an individualized approach based on the complete clinical picture. ●Other medications – Other medications may impair platelet function. As an example, the Bruton’s tyrosine kinase (BTK) inhibitor ibrutinib inhibits platelet aggregation by interfering with activation signals. The role of platelet transfusion in patients with ibrutinab-associated bleeding despite a sufficient platelet count is unknown, and decisions are individualized according to the platelet count and the severity and site of bleeding. Massive blood loss — Patients with massive blood loss from surgery or trauma are transfused with red blood cells (RBC), resulting in partial replacement of the blood volume with a product lacking platelets and clotting factors. In this setting, we transfuse RBC, fresh frozen plasma (FFP), and random donor platelet units in a 1:1:1 ratio. As an example, a patient transfused with six units of RBC would also receive six units of pooled platelets or one apheresis unit (both of which provide approximately 5 x 1011 platelets) and six units of FFP. (See “Initial evaluation and management of shock in adult trauma”, section on ‘Transfusion of blood products’. ).